The Spix's Macaw (Cyanopsitta spixii) is listed as Critically Endangered (Possibly Extinct in the Wild). Outcomes: One last bird was discovered in the 1990 search; by 2000 it had disappeared, and the species was declared Critically Endangered (Possibly Extinct in the Wild). In 2002 a captive Spix's Macaw was found living in the United States by parrot enthusiast Mischelle Mück. With the help of WPT's Director Dr. James Gilardi, and after an intense five-month effort by Mück and a number of veterinarians, geneticists and government officials, the macaw named Presley was returned to its native Brazil to join a breeding program in Recife, after about 25 years in captivity in the US. He was paired for a time with a female, but no breeding occurred. There are a number of birds in private hands now. World population: Likely extinct in the wild; less than 150 in captivity. Where found: Formerly ranged in the Rio Sao Franscisco Valley, in N Bahia, Brazil. History: The Spix’s Macaw (Cyanopsitta spixii) was originally found in a very small section of the Rio Sao Franscisco Valley in N Bahia, Brazil. The species was discovered by Johann Baptiste von Spix a century and a half ago, and found again in 1985-86 in the same area. By 1987 and 1988 just three birds remained and these were caught by trappers. In July 1990 a single male was discovered in the area, and it was paired with a female Blue-winged Macaw (Primolius maracana). A female Spix’s was released from captivity in 1995 and initially paired with the male, then disappeared from the area after seven weeks, possibly due to accidental collision with a power-line (Caparroz et al. 2001). As of January 2000 the male Spix’s was paired with the Blue-winged Macaw, with no more sightings of the two after that year (Y. de Melo Barros in litt. 1999, 2000). An official committee for the recovery of Spix's Macaw has collapsed. The government organization IBAMA (Brazilian Institute of Environment and Renewable Resources) established the Brazilian government's Permanent Committee for the Recovery of the Spix's Macaw. There are occasional local reports of wild birds, including from Serra da Capivara National Park, and a bird filmed near Curaçá in Jun 2016. 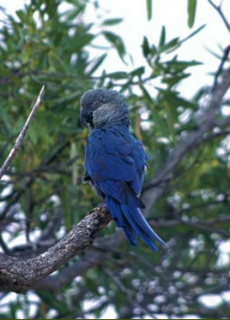 Ecology: Spix’s Macaw required gallery woodland with Tabebuia caraiba trees near creeks in the caatinga for breeding. Its food came from two Euphoribacae plant species. Birds used well-used flight paths to and from food sources and until the 1980s were strongly gregarious.